Striped Dress Week: Hunter Green Striped Dress from Summer to Fall + Linkup. As I write this, it is a very cold Wednesday night here in Michigan and to me it feels like the first true Fall day, since the day was chilly and the wind was very high, too. I am completely covered with a warm and thick fleece blanket as I type this. It is also September 30th which means September is wiped away. Just like that. 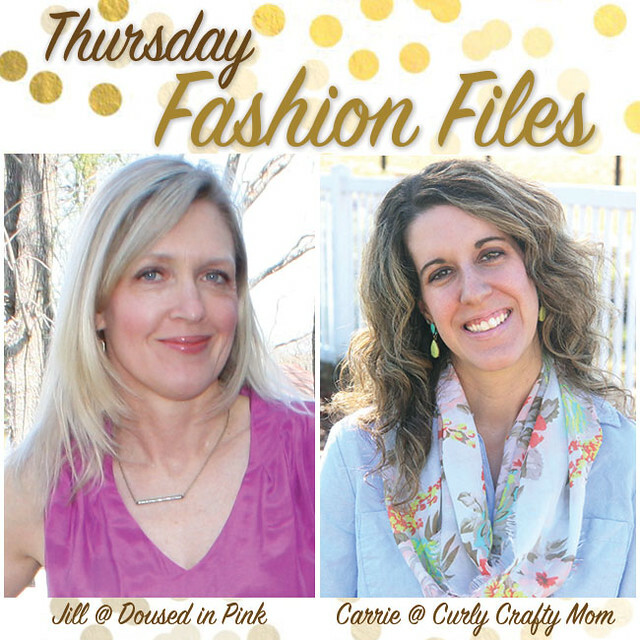 Another thing happening today is that I am co-hosting the Thursday Fashion Files with the Lovely Ladies of Curly Crafty Mom and Doused in Pink. If you do not follow these two ladies yet, you should. 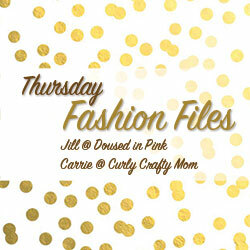 Jill and Carrie are both super stylish, they are mothers like myself, they are on a real budget and their blogs have a little bit of everything. So yeah I am scheduling the link-up to go live for tonight, but it will be midnight soon so all Thursday long, you are stuck with me as your co-host. So, if you haven't made a stop at your local Old Navy this Fall, run there! Their Fall collection is gorgeous, totally on trend, pretty well-made and perfectly chic. I may have gone there a couple of times myself and yes I did add several new things to my closet. This Hunter Green+Navy Striped Dress was one of them. This shade of Green is supposed to be huge this Fall. I wore a similar shade last week, too. I first wore this dress a couple of days ago and it was another windy day as you can see from my pictures. But it was in the 70s so I paired it with some Olive Green Thong Sandals for a Monochromatic Look and I added a pop of Fuchsia via my Fuchsia+Gold Striped Silk Belt (Sandals and Belt are from Old Navy, too). I dressed up the ensemble a little bit with some Silver and Crystal pieces (Necklace, Bracelets and Chandelier Earrings). I love this Necklace by Givenchy - it is a beautiful little piece that makes a punch! Also, this Monochrome look is perfect to link with Jac for her "Spotlight Weekly" whose theme is "Monochromatic" for tomorrow. The second outfit is what I actually wore (earlier) today. And trust me the layered wool-blend cape I put over the dress was necessary. For a day in the low to mid 60s with crazy winds (that made it feel about 50 degrees), I bundled up by pairing the Dress with another new piece - this Gorgeous New Cape I purchased at Forever 21 a couple of days ago. The Colorblocked stripes of the Cape worked well with the Hunter Green+Navy Stripes of the Dress since most of the stripes of the cape are navy. Overall I liked all the Dark, definitely Fall-ish Colors of this Outfit. I played off the Maroon of the Cape by wearing my Burnt Orange Fedora and my Cognac Suede Fringe Boots. My Brown Patchwork Coach Cross-body worked flawlessly into this Outfit, too. I am a huge fan of this outfit. It is new to me, but I can see this type of outfit become a Fall uniform. 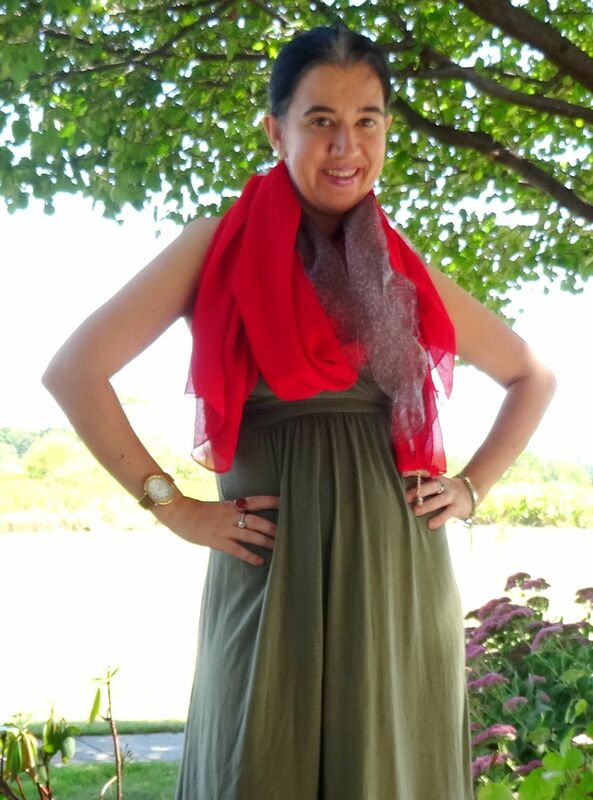 My friend Whitney with Casey and Carrie are doing a "Create 28 Fall Looks" challenge and the first prompt is "Favorite Go To Look" which for me is this look. Gold Tone Pave Collar Necklace w/ 3 large Pearls: Givenchy (very similar by BCBGeneration, great deal, my favorite), (similar by F21, best deal), (similar). Silver+Crystal Chandelier Earrings: White House Black Market (similar by JC Penney), (gorgeous option by Swarovski, on huge sale, my favorite), (similar, great deal, love these). Stretchy Little Pearl Bracelet (set of 4): Express (gorgeous freshwater pearl option by Kohl's, great deal, my favorite), (fun option by Kenneth Jay Lane, on sale, love this). Hunter Green+Navy Striped, Elbow-Sleeve, Scoop-Neck, Ponte Dress: Old Navy (New) (same+on sale, comes in different colors/stripes), (very similar, great deal, love this), (similar by the The Limited, also comes in black+white, on sale, my favorite), (similar by Old Navy, on sale). Fuchsia+Gold Silk Shantung Striped Sash Belt: Old Navy. Olive Green Thong Sandals: Old Navy (similar in gold by MK, great deal, my favorite), (similar in black by MK, love these). Tortoise Gold-Tone Necklace w/ Colorful Stones: Target (New) (very similar by Express, love this), (similar by J.Crew Factory, best deal, my favorite). Orange+Gold Metallic Fedora: Arden B (gorgeous retro option by Shabby Apple, great deal, my favorite), (similar in tan+orange by North Face, on sale, also comes in gray, love this), (similar, best deal). Brown Leather Patchwork Small Cross-body Logo Bag: Coach (similar, best deal, love this), (similar by The Sak, my favorite), (current gorgeous option by Coach, Splurge). Navy, Colorblocked Striped Cape/Poncho: Forever 21 (New) (very similar in B+W stripes by F21, great deal), (similar in tribal print by F21, great deal, my favorite), (similar hooded poncho by F21 in dark green plaid, best deal, love this). Cognac/Camel Real Suede Stiletto Booties w/ Fringe on the side: Frye (very similar by Toms, love these), (very similar in a chocolate shade), (similar in a wedge by Nine West, great deal, come in 3 colors, my favorite), (similar w/ low heels by Target, best deal). Jalynn, Jolynne, Lauren, Linda, Penniless Socialite, Rachel, Tara and Vicki here + here. 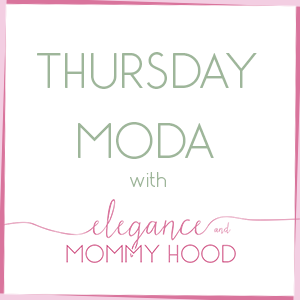 Ada from Elegance and Mommyhood is our co-host this week. Ada is a bargain fashion blogger and also a mom to a sweet girl named Vivi. She always leaves the sweetest and most thoughtful comments. Be sure to stop by to visit her if you haven't already! You can also follow her on: Bloglovin', Google Friend Connect and Pinterest. Striped Dresses Week: My Favorite Striped Dresses at the stores, Currently. So, this week is Striped Dresses Week. I am loving so many current wonderful Striped Dresses - there are endless options for everyone's style and taste. So today I bring you my Favorite Striped Dresses, currently being sold at 5 of my Most Favorite Stores. You are welcome! Banana Republic: This brand always does it right. I think they are just classy, on point, modern, urban-chic and ultimately elegant. Their Dresses are usually very well-made, too. They will last you for a good long time. There are currently more Striped Dresses at Banana but my top 3 picks are below and you can see why! The first dress - love at first sight. It will be mine when it goes on sale. White House Black Market: Make no mistake, WHBM has some of the Best Dresses one could ever find. They are usually expensive but WHBM puts their items on sale so soon. Plus, the sales can be combined with coupons and their 5% off membership card. Actually all of their clothes are beautiful, classic, feminine and also most materials are very practical. Their ponte and jersey knits are the best. I should know, at least 25% of my clothing comes from there. I own at least 20 of their dresses. Seriously though, I would love to own all the 9 below (that I chose). One can only dream! These are ALL on sale and WHBM has at least a dozen more Striped Dresses most of which are on sale, too. H&M: I have always liked the urban, modern, casual-cool and European vibe of H&M's clothes. But in the last 3 years especially, I have been enamored with their clothes, especially their dresses. As a matter of fact, I have purchased a few H&M Striped Dresses in the last couple of years (1, 2 and 3). I clearly love Stripes especially in Dresses and I adore all 3 of my Striped Dresses from H&M. They currently have a few cute striped options, in different styles, shapes and colors and all for a steal! I narrowed it down to 4 favorites! The Limited: One of the earliest brands and stores I discovered is The Limited. I have been shopping there since I was 19 and a sophomore in college. Their designs are sophisticated, feminine, classy, office-appropriate and stay current to the on-going trends. I particularly love their Pants, Pencil Skirts, Jewelry and Dresses. I own over 30 Dresses from The Limited. They are a little mid-to-high priced but they always have a sale. Loft: I only discovered Loft about 5 years ago (where had I been?). I had shopped at their more expensive, dressier sister store Ann Taylor for a few years before though. Needless to say I now love Loft more. Like The Limited they are almost always running sales and promotions so really you shouldn't have to pay full-price. What I love about Loft is that almost all of their clothes can be both dressed down or dressed up. They are office-chic and yet casual enough. They have many Striped Dresses currently, but below are my top 4. So, did I convince you yet? You definitely need one (or three) New Striped Dress this Fall? I gave you 22 options today. Which are some of your favorites? I am telling you, I wouldn't mind owning each single one. Plus, with the rest of my Striped Dresses, I would have a new Striped Dress to wear each day for a month, and then some lol! Leeanne, Linda, Liz, Morgan, Nicole, Sarah, Tameka, Tara, The Stylish Housewife, Tiffany, Vicki and Victoria.